Exactly! Thank you Jim. If you don’t like your job, change it. If you don’t like where you live, change it. If you don’t like how you think change it. The only thing that keeps you from a happier life is YOU! Your true friends will support you. Your family will support you, even if they don’t agree. You want a better life you have to be willing to change because whatever you don’t like about your life now is not going to change for you. Posted on January 16, 2015, in Quotes, Variety Friday and tagged Jim Rohn, Motivational Speaker, quotes, Variety Friday. Bookmark the permalink. 5 Comments. Thanks for sharing this. A great quote there, nicely said and very true indeed. 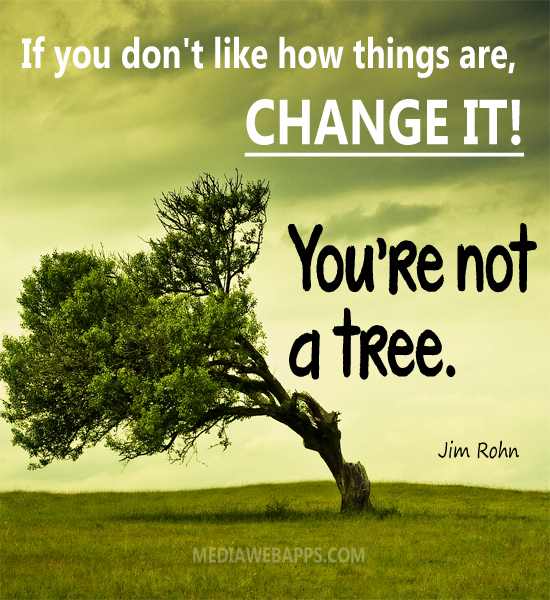 Agree with all your point’s on Change It!